Abingdon, VA Monday, Jun 27, 2016. 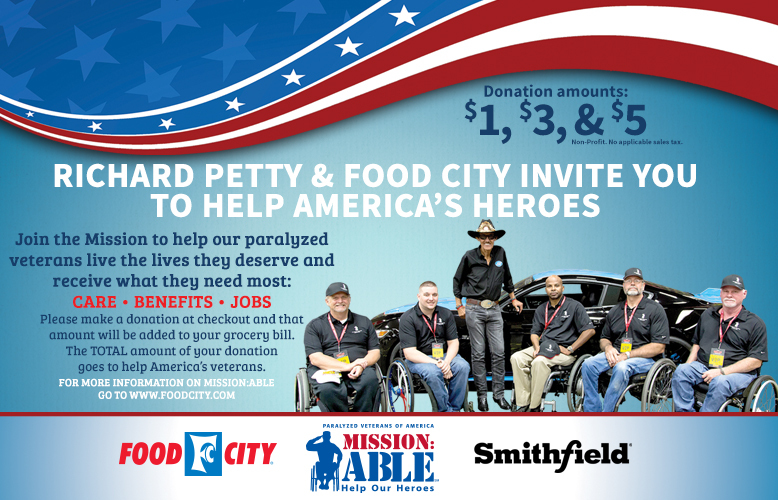 Food City and seven-time NASCAR Champion, Richard Petty have once again teamed up to benefit Paralyzed Veterans of America’s Mission: ABLE campaign. For 70 years, Paralyzed Veterans of America (Paralyzed Veterans) has been on a mission to change lives and build brighter futures for our seriously injured heroes. The Mission: ABLE campaign was designed to enlist Americans – citizens, communities and corporations – to help ensure our paralyzed heroes are provided the physical care needed to live a healthy life; receive the benefits they’ve earned through military service; and obtain job training and opportunities for new and fulfilling careers. The campaign, which will be featured throughout the company’s retail supermarket chain, begins July 6, 2016 and continues through August 2, 2016. Customers wishing to make a contribution simply need to select the desired dollar amount - $1, $3, or $5 and it will be conveniently added to their order total. 100% of the donations collected will remain local and benefit Paralyzed Veterans within the region. In addition, Smithfield, partner of Richard Petty Motorsports, has joined the mission again this year and will support the Food City Mission: ABLE campaign with special offers throughout the campaign this summer. More than 44,000 American veterans live with paralysis. Spinal cord injuries can cost up to $3 million per person in health-care expenses, yet veterans’ benefits aren’t always guaranteed. An estimated $25 billion in veterans’ benefits dollars go unclaimed every year. More than 85% of veterans with severe disabilities are currently unemployed. Paralyzed Veterans’ Mission: ABLE programs ensure they are able to receive the benefits they’ve earned, able to access the quality care they need to live a full life, able to get the job training and opportunities for new careers and able to enjoy competition and camaraderie through sports. For more information on Paralyzed Veterans of America or Mission: ABLE, visit their website at www.mission-able.com. Headquartered in Abingdon, Virginia, K-VA-T Food Stores (Food City’s parent company) operates 135 retail outlets throughout southeast Kentucky, southwest Virginia, east Tennessee, Chattanooga and north Georgia. Paralyzed Veterans of America is the only congressionally chartered veterans service organization dedicated solely for the benefit and representation of veterans with spinal cord injury or disease. For nearly 70 years, we have ensured that veterans have received the benefits earned through their service to our nation; monitored their care in VA spinal cord injury units; and funded research and education in the search for a cure and improved care for individuals with paralysis. As a partner for life, Paralyzed Veterans also develops training and career services, works to ensure accessibility in public buildings and spaces, provides health and rehabilitation opportunities through sports and recreation, and advocates for veterans and all people with disabilities. With more than 70 offices and 34 chapters, Paralyzed Veterans serves veterans, their families, and their caregivers in all 50 states, the District of Columbia and Puerto Rico. Smithfield Foods is a $14 billion global food company and the world’s largest pork processor and hog producer. In the United States, the company is also the leader in numerous packaged meats categories with popular brands including Smithfield®, Eckrich®, Nathan’s Famous®, Farmland®, Armour®, Cook’s®, John Morrell®, Gwaltney®, Kretschmar®, Margherita®, Curly’s®, Carando® and Healthy Ones®. Smithfield Foods is committed to providing good food in a responsible way and maintains robust animal care, community involvement, employee safety, environmental and food safety and quality programs. For more information, visit www.smithfieldfoods.com.